Rhoda Draws in her studio. 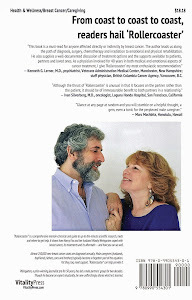 Humor can help patients and caregivers cope. So can artistic flights of fancy. 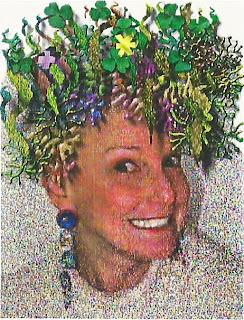 At a time when her breast cancer and chemo-induced loss of hair turned my wife, Nancy Fox, into a portrait of cheerlessness, Rhoda Draws, a painter-caricaturist-friend based in Mill Valley, California, superimposed some playfulness on half a dozen photographs. Nancy couldn't help but smile. 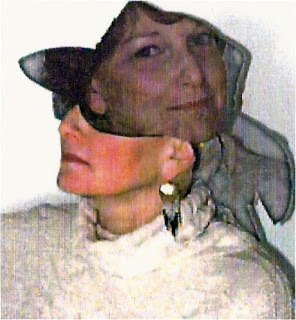 Rhoda, who's also an author and teacher, presented the re-imagined photos (aka digitally enhanced, or cyber-imaged) to Nancy as a gift. 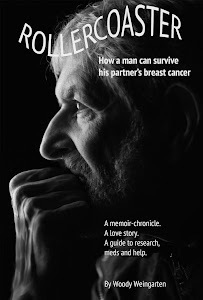 Immediately, my wife for a while stopped mourning the loss of her shoulder length, red hair — what she describes in my new book, "Rollercoaster: How a man can survive his partner's breast cancer," as "the one part of my body that I have loved unconditionally." None of the distinctive photos accompany my narrative. Not because Nancy doesn't appreciate them 20 years after her diagnosis and treatment, but simply because I, Woody Weingarten, didn't use any illustrations at all in the book. Nancy used the six re-imagined, often whimsical photos on a one-page flyer she sent to friends and family members who aided her. She added this text: "Thanks for your helping hands…and your loving heart…during all my changes." The front of our refrigerator is decorated with two of the images — on magnets. They still make us smile, every day. And remember the ups and downs of the past triggered by passages in "Rollercoaster." • "Her dread of going bald had careened off the charts. Just before turning out the lights she recalled that as a girl with braids down to her waist, she'd panicked when her mother demanded she cut them off." • "I do wish she could consistently see herself as I do, as a beautiful creature with or without hair." • Sadness about her missing hair — even though that loss was temporary — remained the biggie for Nancy. 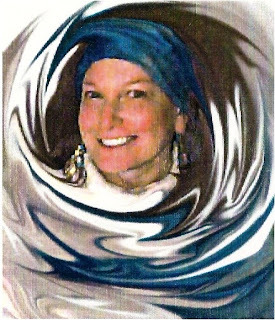 A year after her final treatment, she wrote in her journal that it 'was clearly the psychologically devastating part of the cancer." 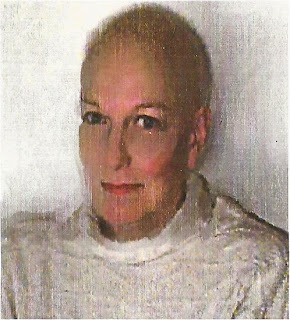 • It had taken more than two years before she could look at images of her baldness…She agreed at last to put the photos of her hairless stage into two albums…[She] triggered my caregiver button: 'You and I will never see it the same way,' I replied sincerely. 'Your high cheekbones and eyes showed off better when there was no hair to look at. The fact is, you're lovely both ways.'" Two decades after her breast cancer diagnosis, Nancy's loveliness still makes me tremble. Even though her hair is draped around her shoulders again.